Over the last 35 years, I have successfully treated many scoliosis patients using the CLEAR technique. Many of them have the same story. After getting a scoliosis diagnosis, they are told that surgery is their only choice. Many are told their condition will continue to get worse. These families are told that their only option is to “watch and wait” while the curve progresses to a point where surgery is needed. I’m here to tell you that there is another option. Using the CLEAR method, doctors like me have helped thousands of patients to avoid surgery, and I want to help you to do so, too. If I could show you an option to correct your child’s scoliosis without surgery would you take it? Are you looking for an alternative to surgery and “watching and waiting” like Michael did? Back in 2014, Michael wanted his 9-year-old daughter, Alice, to have a normal childhood. He wanted her to do the things she loved most like gymnastics, trampolining and riding horses. This “watch and wait” approach is typical with a scoliosis diagnosis. The curve is not severe enough for surgery, but the doctor is not educated about exercise-based treatments, so the family is simply told to wait until the curve gets worse. Waiting was not something Michael wanted. However, like many, he accepted the orthopedist’s suggestion and went home. Six months later, Michael came back to the orthopedist for a reassessment. His daughter’s scoliosis had progressed from 25 to 32 degrees. The orthopedist now placed her on restrictions. She wasn’t able to do her favorite activities like gymnastics, horse riding, or trampolining. Worse yet for Michael was the talk about spinal fusion. Doctors told him that they were now waiting for his daughter’s spine to hit 40 degrees, at which time she would undergo spinal fusion surgery. His daughter left the hospital with no hope, being told that nothing outside of surgery could be done. Michael felt like doctors were telling him that he and his family had to wait for the inevitable. That there was nothing that could be done. However, Michael refused to accept this. He knew that there must be another way to reduce the curvature. He refused to sit around and wait for his daughter’s condition to deteriorate further. Michael then began a 3-day search, learning as much as he could about treatment options. Like most parents, he wanted to fight for his daughter, and he spent the next three days without sleep, scouring the internet for the solution that he knew must be out there. He came across many other specialists who recommended the same treatments the orthopedist had: bracing and then surgery. Others recommended standard physical therapy, but his research showed him that this would not work in his daughter’s case. On the third day of his search, Michael found my website and discovered the CLEAR method. After reading the literature and speaking to me over the phone he was ready to commence treatment. It wasn’t easy for Michael. He and his family lived in London and had to travel to my practice in the United States. This is not uncommon, however. 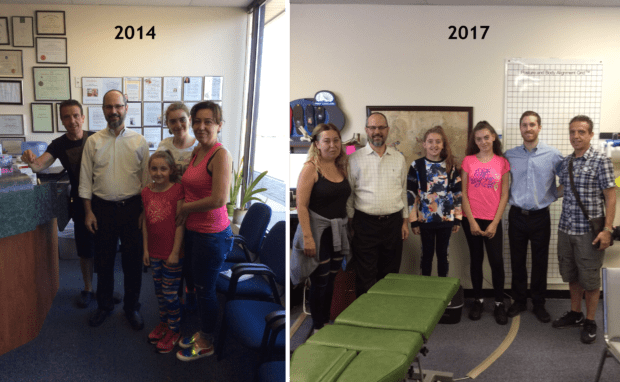 Scoliosis patients come to see me from all over the world to receive CLEAR treatment and avoid surgery. To make matters even more difficult, many of his friends and family thought he was crazy to travel so far and said he was taking far too big a risk. The orthopedist told him that it was impossible to reverse scoliosis with exercises-based care and ridiculed Michael for suggesting it. However, despite these challenges, Michael brought his daughter to see me and receive an intensive CLEAR treatment. After only two weeks his daughter’s curve had reduced from 36 degrees to 25 degrees, a reduction of 31%. The family was overjoyed. It was something they had been told was not possible. Upon returning home, Alice’s original orthopedist verified the reduction and congratulated them. CLEAR practitioners have something other doctors do not. We call it the CLEAR method: A unique three phase treatment program designed to correct spinal curvature in a non-invasive way. Using specialized equipment and techniques we retrain the body and brain to halt the progression of scoliosis and reduce its curvature, in many cases to 10 degrees or less. Our clients enjoy a lifetime of results, without the danger of surgery. You may have wondered why your current treatment plan is not working for you or your child. The fact of the matter is many doctors simply do not have the specialized training or facilities to treat scoliosis using the proprietary techniques used in the CLEAR method. Michael recently flew out to our clinic for the second time. His daughter received treatment that reduced her scoliosis even further. This time, he also brought along his second daughter, Sophia, for treatment, who was also recently diagnosed with scoliosis. Both of his daughters will return home with customized home exercise plans that allow them to continue to improve their curves. Thank you for taking the time to read Michael’s story. If you or your child needs help reducing scoliosis, the CLEAR method offers you the best alternative to surgery. Many scoliosis patients receive CLEAR treatment after years being told surgery was the only way. Like Michael, you may be skeptical, but after only a few weeks with great results, you can regain hope. Simply enter your email address below to receive your free copy! This post was submitted by Dr. Andrew Strauss of The Hudson Valley Scoliosis Correction Center. Dr. Strauss has been CLEAR-certified since 2008 and offers both Standard Treatment and Intensive Care at his practice in New York. I have Scoliosis,I am interested in learning more about this treatment. We look forward to hearing from you, and helping you to discover more about our unique and innovative approach to scoliosis treatment! Is this method similar to Schroth Therapy? There are many different scoliosis-specific physical therapy schools & techniques (you can find a list & a research review of them on our website here). Most of these techniques originated in Europe, where they do not share the same bias against exercise-based approaches to scoliosis that exists among orthopedic surgeons in the U.S. (for more information about this, check out the book “Scoliosis and the Human Spine” by Martha Hawes PhD, which is available from the National Scoliosis Foundation). CLEAR is similar to these approaches in that it does involve activities such as active exercises to improve balance, stability, & mobility; postural feedback & body awareness training; and other physical modalities. However, we also include several innovations & additions, such as specialized massage, advanced chiropractic adjustments, whole-body vibration therapy, ligament rehab, 3-dimensional spinal de-rotation & traction, and other therapies. It’s also easier for chiropractors in the U.S. to take x-rays, compared to physical therapists. Some CLEAR doctors are Schroth-certified as well, or work with PT’s in their office who are. I hope this information is helpful! Feel free to give us a call at (866) 663-7030 and I can explain the difference (& similarities) in more detail if you would like. The story above you shared talks about the childs curvature of 30 degrees, now after 40 degrees surgery is recommended. My question to you is do you treat children with a higher curvature degree? My daughter has a curvature of 56 degrees and we are told the only solution is surgery. Would your treatment help lessen the curvature this far advanced? Hello, and thank you for taking the time to ask your question! The answer is yes, the CLEAR protocols have helped many people with severe (45 to 60 degree) curves to reduce & stabilize their Cobb angles below 45 degrees, and avoid surgery. 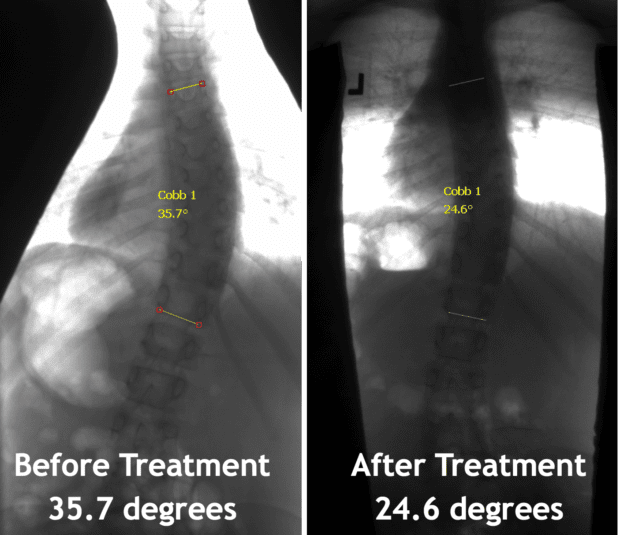 In addition, CLEAR has also begun working together with some scoliosis surgeons who have recognized that patients who undergo CLEAR treatment prior to surgery results in superior outcomes with fewer complications. Essentially, choosing to go through CLEAR treatment results in either avoiding surgery, or a more successful outcome if the decision is made to undergo surgery. You can find out additional important information about CLEAR’s approach to severe scoliosis here, as well as a case study on how a long-term commitment to CLEAR treatment resulted in successful reduction & stabilization of a severe curve (and prevented surgery) with one young woman on our Research page, here (it’s the second-to-last article on the page, titled “Long-Term Chiropractic Management of Progressive Adolescent Idiopathic Scoliosis: A Case Study”). If you have any other questions, please feel free to reach out to us at (866) 663-7030, or by e-mail at care@clear-institute.org. We wish your daughter all the best of success in her scoliosis journey! My 4 year old was just diagnosed with spinal asymmetry of 4 degrees. I was told I couldn’t call it scoliosis because it is not at 10 degrees. They said to just come back in 6 months for a follow up. Shouldn’t I start doing something now to help it from progressing since she is so young? I understand your concern, but minor spinal asymmetries are actually quite common in young children, and the vast majority of these will correct themselves and disappear over time. Still, it’s wonderful that you are taking the initiative and being aware of your daughter’s spinal health, and there are additional steps you could take to be absolutely sure. You could consider reaching out to a CLEAR chiropractor for an evaluation of your daughter’s posture, back, spine, balance, and neck. Many chiropractors specializing in upper cervical (neck) care have noticed a correlation between mis-alignments in this area, and the eventual appearance of a scoliosis. There are various theories as to how a problem in the neck could cause a problem in the spine, most of which involve the spinocerebellar tracts (nerves that connect the postural control centers in the cerebellum to the involuntary postural muscles along the spine), the ligaments (which have special position & movement sensors in them that play a role in spinal alignment) and the visual righting reflex (the eyes will always stay level to the horizon, so a misalignment in the neck could cause imbalances below as the eyes align themselves). CLEAR doctors are educated and aware of numerous subtle risk factors that, when evaluated all together, could indicate whether or not a child under the age of 10 is likely to develop scoliosis when they hit their growth spurt. Many of these risk factors can be modified with chiropractic corrective care and specialized exercises. As an example, Dr. Simoneau is a researcher in Canada who has spent many years studying the correlation between proprioception (the body’s ability to orient itself with the eyes closed) and scoliosis. He has noticed that many kids that have problems with proprioception (standing on one leg with the eyes closed) have a higher risk of developing scoliosis. By correcting spinal misalignments & restrictions, and performing some simple but effective balance exercises, the body’s proprioceptive ability can be improved. I hope this information is helpful; please feel free to let us know if we can provide additional assistance or information!